Breast Implants: So Gross You Need to See! THERE THEY ARE! !- all 550ccs x2 of them and they are quite HEAVY! 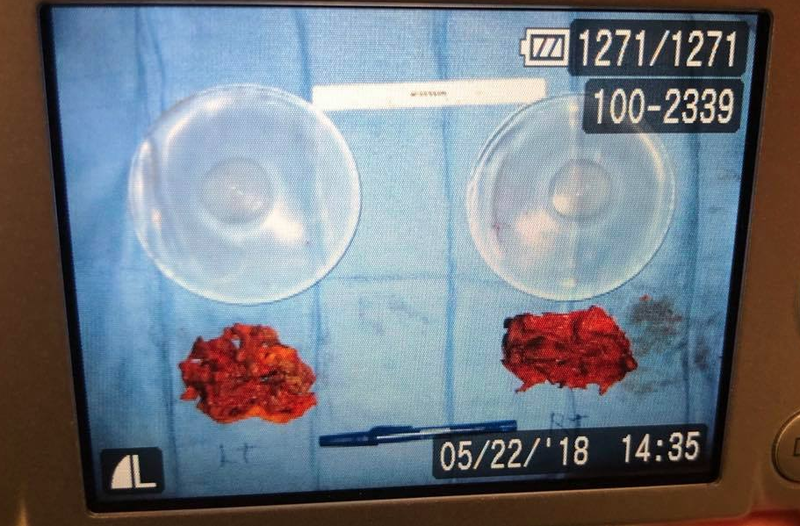 All the capsule (the red blob below) was successfully removed from my body and rib cage. After surgery it is peeled off and away (kinda like a sausage casing 😜). Although yes, the silicone shell can make you sick, it’s our bodies natural defense to build this capsule around the implant, that slowly starts to give us the BII auto-immune type symptoms and inflammation. If you have implants, yes, yours look like the picture in the first comment, inside you, too. It’s what our body miraculously does to foreign objects to protect us. It took years for my many once insignificant symptoms to really stand out. It can take up to a year, even two, for the body to heal after implant removal. My 550 CC Silicone casing and filled implant with capsules peeled off. Implants with capsule before being peeled off. The capsule forms immediately after implant surgery.